Peer, What?! Let the Youth Lead! 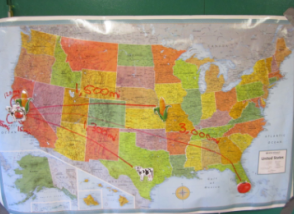 This service highlight was originally posted by the California Farm to School Network and was written by FoodCorps Service Member Roanna Cooper with Food, What? !, a youth empowerment program in partnership with Life Lab. Read on to learn about how Roanna is leading teen youth and supporting them with events, workshops and work days throughout the year. Beginning in 2013, “Food, What? 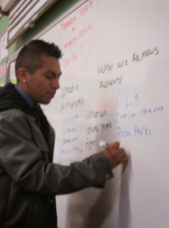 !” began a partnership with the Santa Cruz County Office of Education to extend its reach to hundreds more youth across the county by offering a peer-to-peer Community Educator Workshop Series in various classrooms throughout Santa Cruz and Watsonville. This has not only allowed FoodWhat to offer hundreds of area youth some of the youth empowerment, food justice and health content utilized in its core programs, but has also provided a unique opportunity for FoodWhat Alumni to step into a strong leadership role with their peers, furthering positive youth development outcomes. Peer-to-peer education draws on the credibility that youth have with their peers and leverages the power of positive role modeling. In this model, a young leader is trained on a topic and then teaches this topic to his/her peers. Contrasting traditional models of teacher as authority, a peer-to-peer model offers a context where teacher and student are equals and share some similarities, making youth more likely to hear and personalize the message and thus more readily change their attitudes and behaviors. There are also many benefits for youth who are in the role of educator. By learning to master a topic and share it with their peers, youth step into strong leadership roles, serving to increase their self-esteem, confidence and connection to community. It also provides an important platform where youth are viewed and treated as resources rather than problems. 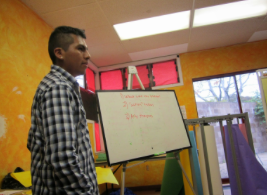 In its second season, the 2014 FoodWhat peer-to-peer Community Educator Series brought three FoodWhat Alumni -- Miguel Zarate, Uriel Reyes and Vicky Pozos Bernal -- into eight classrooms across the county to deliver workshops related to health, food justice and building youth power. 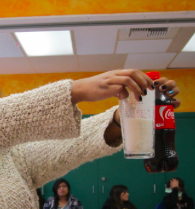 Week One featured, “What You Drink, What You Think: Youth Dollar Power,” a workshop around sugar content of popular beverages, label-reading and the power youth hold through the choices they make as consumers. Recent FoodWhat alumni, Miguel Zarate, began by engaging youth in a brainstorm around what processed sugar does to our bodies. He offered youth an easy equation to calculate how many teaspoons of sugar are contained in beverages and invited them to come up and measure it out on some popular drinks. He raised the question of why a company would split sugar content into numerous servings on its nutrition label, when most beverages are consumed in one serving. Miguel concluded the workshop by asking youth, “how many of you vote?”, challenging them to think about how they vote each day by the way they spend their dollars. 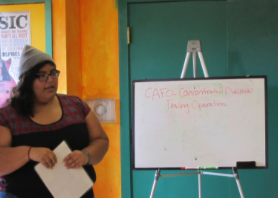 The Third Week, veteran FoodWhat Community Educator, Vicky Pozos-Bernal, led youth through an exploration of the food system in “Trace Your Taco,” looking at agriculture, labor and meat production in the United States through examining a Taco Bell taco vs. a real food taco. She immediately got students’ attention by passing around a Taco Bell taco and asking youth to list its components. She shared where and how the majority of these products -- corn, meat and tomatoes -- are sourced for the fast food industry in the U.S., highlighting worker exploitation, animal cruelty, environmental degradation, and compromised food quality inherent in an industrialized conventional food system. Vicky concluded the workshop by presenting a “real food system,” where ingredients are grown locally, without the use of pesticides and other harmful chemicals, and workers are paid well and treated with respect. She acknowledge the challenge of eating “real food” and offered some suggestions of local taquerias in Watsonville that serve real food tacos at affordable prices. How Does This Relate to Youth Empowerment? Supporting youth to step into a leadership role and building their voice and power, is crucial in a world where, far too often, youth are marginalized and often times treated as delinquent. Working in a peer-to-peer model and providing young leaders with a framework and skills to be positive role models, helps to affirm the power that young people have to lead, while also tapping into important resources youth hold as youth -- their ability to relate to their peers’ life experience, adolescent concerns and pressures and the general lack of power youth feel in traditional educational modalities where adults are viewed as the ultimate authority. Instead, youth are trained on workshop content and facilitation techniques and become the critical factor in creating positive change, hence empowering and serving youth from within. As an adult ally, watching our Community Educators lead youth in these workshops, solidified for me the power of a peer-to-peer model in youth empowerment and justice work. Could I have stood in front of a room full of high school students and drove home the message of youth power the way Miguel did when he shouted, “That’s our power as youth!”? Likely not. Would it have been as convincing or empowering for me to talk to young people about why they should care about activism rather than Uriel sharing his personal story of living in Watsonville, seeing frightening levels of obesity and unhealthy food being served in the schools he and his little brothers attend and wanting to change it? Doubtful. As a white woman in her thirties, could I have told the narrative in “Trace Your Taco” around the exploitation of farmworkers within the industrial food system as effectively as Vicky, a young Latina woman from a farmworker family in Watsonville who has experienced such exploitation first-hand and sees herself in many of the young people sitting in that classroom? Certainly not. As a justice organization, a peer-to-peer model is important in allowing us to provide youth centered, culturally relevant programming that challenges conventional structures for the youth we serve. Food, What?! is a youth empowerment and food justice program using food, through sustainable agriculture and health, as the vehicle for growing strong, healthy, and inspired teens. We partner with low-income and struggling youth to grow, cook, eat, and distribute healthy, sustainably raised food and address food justice issues in our community. Youth from Watsonville to Santa Cruz join the FoodWhat Crew through spring internships, summer jobs, fall business management positions, and leading big community events on the farm. We create a safe space where youth engage in leadership development, personal growth, and job training. At FoodWhat, we inspire personal transformation by supporting teens in finding their voices and developing lasting confidence in themselves.